Fall in Alaska may be brief, but it brings with it some of the state’s most stunning sights. During the short transition from summer to winter, the autumn leaves flash fiery red, vibrant yellow and rusty orange while a dusting of snow settles atop the mountains. Alaska couldn’t be more picturesque this time of year and visitors can soak it all in on a relaxing rail ride, a road trip or even a hike around any one of the following destinations. Surrounded by trees, the Mt. McKinley Princess Wilderness Lodge offers incomparable views and is in the perfect location for scenic hikes through Denali State Park. There aren’t many species of trees that are able to grow in Denali naturally, but those that are include the quaking aspen, balsam poplar, black cottonwood, paper birch and Alaska birch. In the fall, the white bark of the Alaska birch contrasts with its glowing yellow leaves and is an incredible sight. Near the Denali Princess Wilderness Lodge, visitors can take a walking tour that will give them the opportunity to enjoy panoramic views of snow-capped peaks that really make those autumn colors pop. The fall months truly put the gold in “The Golden Heart City” as the birch and alder trees begin to change colors. Set along the banks of the Chena River, the Fairbanks Princess Riverside Lodge is the perfect place to see the brilliantly colored trees reflect off the water. Visitors heading south to the Kenai Peninsula area are truly in for a treat. Enjoy the view as you travel the Seward Highway, taking in the bright yellow leaves of the birch and alder trees growing along Turnagain Arm. Once in Kenai, the area around the Kenai Princess Wilderness Lodge offers a secluded starting point for hikes among the spruce forests. 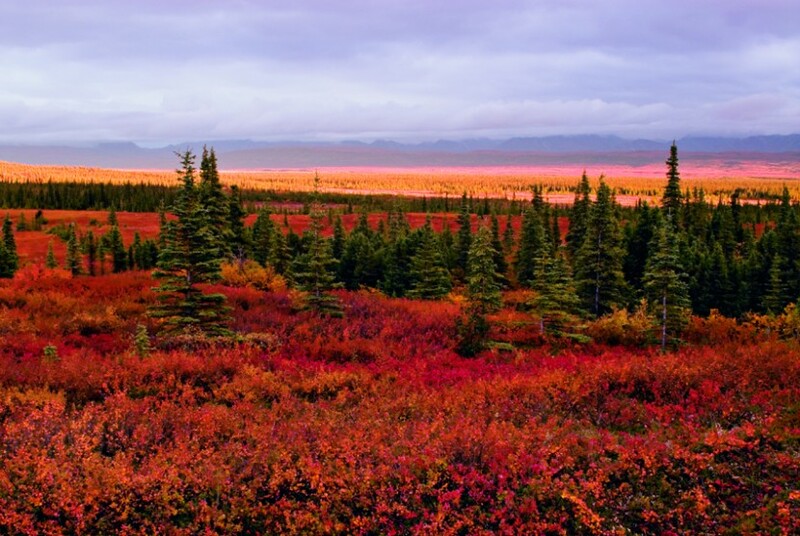 Fall in the Wrangell-St. Elias National Park and Preserve is unlike anywhere else. Visitors are surrounded by quaking aspen, paper birch, black spruce and white spruce culminating in a dazzling display of green, gold and red hues. The Copper River Princess Wilderness Lodge boasts sweeping views of the Wrangell-St. Elias Range, along with the fall foliage reflecting off the Copper and Klutina Rivers. Alaska’s fall season is not to be missed and the Princess Lodges each have a unique but equally extraordinary view. Book your escape to the Great Land for 2016 today!